We have hardly had daylight, at all, the past couple of days......grey, wet for some of the time, and a cold wind....not fun! Some people have been lettin' me know that they have already had snow and I just know that they are being smug about it....ggrrrrr! 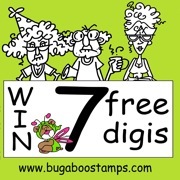 We love Bugaboo Stamps, and we know so many crafters do, too! We appreciate their awesome sponsorship... the images are so much fun! Your card creation should show CHILDREN... and perhaps it will even be for a child! Remember our 'twist of faith'.... your creation should also include a scripture, or quote or an uplifiting sentiment that suits this week's theme. I made the upper sentiment on the computer and layered onto red card....the "Friends" sentiment is a rub-on that's been sitting in my drawer for yonks.......and we're done! Take a look at what the rest of our Design Team has come up with......tons of lovely inspiration! I hope you'll join in the fun, this week.....we all need cards for children at some time, don't we? Hi Anne-Marie. Such a sweet card. Lovely bright colours, fab design and a super cute image. Wonderful little card, Teamie. I like the bright, happy colours -- very much reminds me of children and childhood. This is definitely a card that any child (regardless of age -- thinking MUCH older child - say me) would love to receive! Oh aren't they cute!Great coloring. Thanks for joining us at SSiC. This is so cute and fun!! That's a sweet image and sentiment! I'm impatiently waiting for snow, too!! Such a fun card, Anne-Marie and love those papers! Such a cute cute card!!!!!! Thanks for participating in our MY HEART PIECES challenge!! Such a cute card and I love that sparkly balloon! I am finally getting a little time to visit blogland and will be trying to catch up over the next few days!! So much wonderful inspiration to see!